The True North Film was filmed in Peterhead and Fraserburgh in Aberdeenshire Scotland in 2006 with a predominantly Scottish cast. The writer and director of the True North film was Steve Hudson and the producer was Sonja Ewers. True North was released in 2007. The actors in True North are Peterhead born Peter Mullan Read his About Aberdeen Biography as Riley, Martin Compston as Sean (he played Ewan Brodie the chef in Monarch of the Glen), Gary Lewis as the Skipper, Steven Robertson as The Cook, Su Li as Angel Li, Hark Bohm as Pol, Wang Li Jun as the Chinese Farmer, Ren Hao as Moon Face, Shi Ming as Snakehead and Pat Kiernan as Henri. The True North film tells the story of a Scottish trawler, The Providence (PD 100) and its crew. The skippers son Sean knows his father faces bankruptcy and while at a Belgian Port without a fish catch to pay the mortgage he meets a contact to discuss smuggling. Sean is expecting to smuggle cheap black market cigarettes but instead faces the decision to save his boat and the jobs and welfare of his men or smuggle humans. In a last minute gamble to save The Providence he smuggles Chinese illegal immigrants through a stormy North Sea to Britain. He does not tell his skipper and father but confides in fellow trawlerman Riley so that he can get help aboard ship. The Chinese illegal immigrants are smuggled aboard The Providence into the hold but one Chinese girl, Su Li, aged 12 years, escapes and goes below deck. During the voyage back to the UK the ship's cook notices that food is missing from the galley and sets about investigating. Father and son soon start arguing about the voyage home to Scotland. Skipper wants to land a catch to make the fishing trip worthwhile but his son Sean wants to get home as quickly as possible and offload the Chinese illegal immigrants. Riley tells Sean that if The Providence (PD100) returns to port without a catch it will be searched, especially as they landed at a Foreign Port. The Chinese illegal immigrants are growing colder and colder and Aberdeen seems a long way off. Despite the best efforts of the veteran trawlermen the nets keep returning from the North Sea empty. Even during a violent storm when the fish are usually in plentiful supply in the safety of the depths of the North Sea the nets are hauled aboard empty. Events take a turn for the worst in the True North film when one of the Chinese illegal immigrants dies in the hold. Riley does not go to the son but to the father, The Skipper, and tells him everything. The True North film has courted some controversy in the Buchan and Broch areas of Peterhead and Fraserburgh. Especially when the fishing folk have been working closely with the BBC to raise the profile of their difficult work on the BBC1 series Trawlermen. However the writer and director of the True North film went to Fraserburgh to research his film before starting his writing and learnt about the problems trawlermen face such as low catches and changing fishing quotas, He wanted to raise the dangers that illegal immigrants face when trying to escape their harsh lives and replace it with a life of hope in the United Kingdom. He was motivated by the discovery of the deaths of 58 illegal immigrants from China in June 2000 at Dover port in England. There were 60 Chinese illegal immigrants packed on a container truck and on the ferry the driver feared he would be caught and closed the hatches on the container. All but two suffocated to death. Steve Hudson wanted to highlight the problems of people smuggling to the UK whilst bringing to the attention of the viewing public the dissemination of the Scottish fishing industry. He hopes that his film looks at the human side of people smuggling in the UK from those desperate enough to get involved and their motivations. His film TrueNorth captures the claustrophobic atmosphere of life below decks of a trawler and the sharp contrast of the dangerous and exposed decks. A real trawler boat (the Martha David) was used and filming took place in Ireland and Scotland. None of the scenes were digitally mastered or added so all the production staff had to face the real life dangers faced by everyday trawlermen. A tank shoot would have been easier but the True North film captures the reality of trawling. The real life skipper of the Martha David had to sell his trawler boat after a life time of fishing. The True North film premiered at the Toronto International Film Festival in the Discovery section despite being in post production. The world premiere of True North took place on Monday 11 September 2007. Nominated Best Actor in a Scottish Film from BAFTA Awards Scotland 2006 for Martin Compston for his role as Sean. Nominated Best Film and Best Screenplay from BAFTA Awards Scotland 2006 for Steven Hudson. Winner of the Bronze Torc Award Best Feature Length Drama at the 2007 Celtic Film and Television Festival at Skye. Su Li Won Best Actress for her role as Angel Li in the 2007 Cherbourg-Octeville Festival of Irish & British Film. 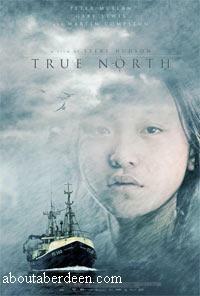 At the same awards Steve Hudson from London won the Best Film and Young People's Jury Awards for True North. Nominated for the Max Ophuls award at the 2007 Max Oph�ls Festival.